Aelathil is on the brink of civil war! Once pampered and spoiled as the only heir to one of Aelathil’s most powerful lordlings, Callan’s world has been tipped upside down by King Ramsey and his mighty dragons. Now he must join the growing resistance or watch as everything his family stood for crumbles away to nothing. After her father is mauled by one of the massive lion-men of the frozen north, Pyra must do her best to hold his seat as Lord until he recovers—all while teaching herself to control the magical spark smoldering inside her. Together, Callan and Pyra will shape Aelathil’s future. For better or worse, they will stand Sentinel over the people that the King has targeted for destruction. Should they fail, Pyra’s people will be buried in the northern wastes and Callan’s family legacy will be turned to ash. Sentinel tells the story of a nation on the brink of civil war. I tend to really enjoy books of this nature. I like political intrigue, and nations on the brink of devouring themselves interest me. I like to see how the nation got to that point, and how the characters are going to have to deal with it. The more unexpected, the more complex, the better. So I went into this book pretty excited. First, I should say that this book felt like more of a foundation than anything else. That’s not a bad thing, but it didn’t really have a self-contained plot. I don’t think it could hold its own without the other books in the series, for example. It’s dependent on them to be what it is. A foundation is interesting because it gives the author room to build on. In that respect, it did pretty well. Ballard built up his world, his characters, addressed the complex situation that is leading them to the cusp of breaking, and he hints at what will come next. Foundationally, Sentinel did a great job at setting up what comes next. In a lot of ways, this felt very much like a coming-of-age book. Our protagonists, Callan and Pyra, felt very young and untested. They were characters I would have loved if I’d been a teenager. They were very well realized, and probably the best developed characters in the book. Unfortunately, the secondary characters felt pretty stereotypical and two-dimensional in comparison. The plot moves forward at a nice clip, but it did wander at times. There were some side stories that never really met the main thread of the book satisfactorily. The ending of the book left me dissatisfied, and there were times when I wasn’t exactly sure why things were happening. Furthermore, there were points where I felt like points or events that had been established and addressed before were repeatedly discussed or mentioned in the plot when they didn’t need to be. This kind of gave the overall flow a sort of lumpy feel. That being said, there were some really interesting scenes, some great cultural details, and some creatures, like dragons, that really intrigued me and kept me interested. Perhaps my biggest complaint is that this book felt very trope-heavy. That’s not a bad thing, mind you. I enjoy a good trope as much as the next person. However, the thing that makes clichés and tropes interesting is a unique twist on them, and I often felt like the author fell short of that mark here. There was a ton of potential. Great main characters, an interesting setup and some good writing, but the tropes just left me feeling like this book never quite moved past being good. 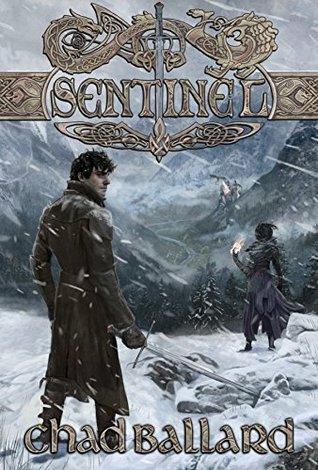 Sentinel is a good book, it never quite moved beyond good, though. It read for a younger audience than I was expecting. It’s a great book for an introduction to fantasy, or for teens who are interested in reading some traditional fantasy stories. It, to me, reminded me a lot of Dungeons and Dragons in the feel of it. If I was in high school, I would have loved it. Is this worth reading? Yes. If you’re in the mood for some traditional fantasy, or if you’ve got a teenager around you want to introduce to the genre, I’d hit this one up with gusto. It was a lot of fun, and a great start to a series. While I do feel like there were some missed opportunities here, I enjoyed every minute I spent reading this book.